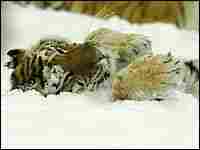 Interviews: Taking a Tally of the Siberian Tiger There's good news for the Siberian tiger. A new survey by the Wildlife Conservation Society finds the population of the endangered species is more or less stable, at about 530 adults and cubs. That's not many, but it's about the same as 10 years ago. 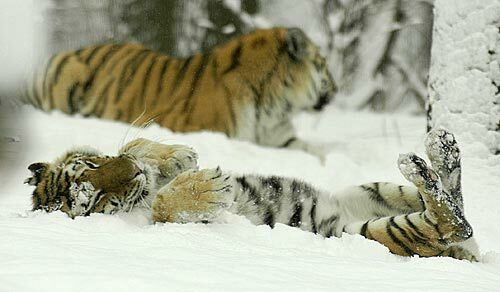 Siberian tigers play in the snow. 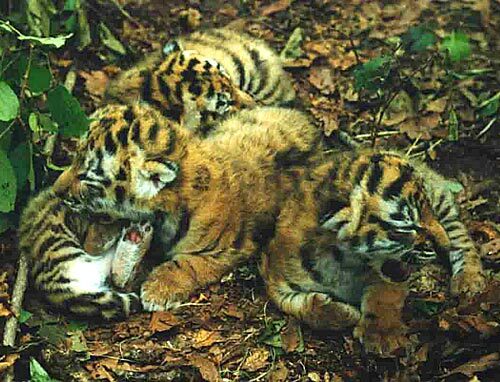 These very young Siberian tiger cubs were equipped with radio collars earlier this year. Wildlife conservationists have just released the results of the first Siberian tiger count in far eastern Russia in nine years -- a study that took 1,000 people months to search, looking for the animals' massive footprints across nearly 70,000 square miles of habitat. The results were something of a surprise: instead of a decreasing population, like most expected, the numbers remained about the same as a decade ago. The total count for the latest survey? 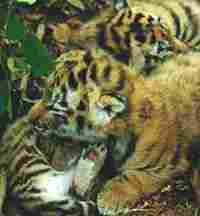 Between 430 to 530 tigers left, including the cubs. In the latest Day to Day interview for the NPR/National Geographic co-production Radio Expeditions, Alex Chadwick talks with Dale Miquelle, director of the Wildlife Conservation Society's Russia program and project director of the Siberian tiger survey. 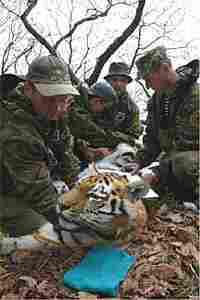 "We consider this a success, to be able to maintain stability in tiger populations when in most parts of Russia, the numbers are crashing," Miquelle says. "We're pretty happy with the results." Miquelle says two factors may be responsible for the steady population numbers. The economy of Russia is improving compared to 10 years ago, and there is less pressure on hunters to poach the tigers to sell their pelts and body parts. Also, there were more and better-trained trackers hunting the big but elusive cats.